It’s that time of year y’all. We’re desperately holding on to our summers when we know that in just a few weeks we’ll be deep in orientations, classes, workshops, and meetings. The important thing is that we’re not there YET and we still have some time to get in some great design projects, like today’s submission. Dan Vinson, Coordinator of User Services and Library Assessment at Mount Mary University recently created some simple, easy-to-read, and attractive signs for the Haggerty Library & Learning Commons stacks. They’ve totally inspired me to start a similar project at my own library. Last week April and I were lucky enough to attend and present a panel at ACRL 2015 in Portland. Creating attractive conference materials is challenging, but there were so many fantastic posters at ACRL that we knew we had to feature them on Librarian Design Share. This is the first in a series of posts on eye-catching design we spotted at ACRL. We’ve tried to give each of the presenters/designers a chance to share their creative process with you. We hope you enjoy it! One of the most challenging conference presentation mediums is, I think, the research poster. There is so much information to share in such a limited space. You want your poster to be attractive and engaging, but you also want it to tell a story. Finding the right balance between text and images can be difficult. The posters below are ones that caught our eye with their interesting presentation design. Our poster was designed using Canva, after I put out a call to the Twitter-verse asking for a “better way” to design posters, and Dani Cook, a librarian at the Claremont Colleges, suggested Canva. The only drawback of Canva was that I could only make the poster a little over 4 feet wide. However, the ability to have the poster in the cloud allowed Jimena and I to work on it and make changes without having to save and email designs back-and-forth, which I loved! And Canva has templates and free clip art, which we used liberally (all of the icons and design elements in the poster came from Canva’s free clip art). Before becoming a librarian I held a position as the Marketing Coordinator for University Housing and Dining Services at Oregon State University. I supervised a full-time graphic designer and routinely worked with student designers. Although I am not a graphic designer myself, my past experience in marketing greatly informed the design of our poster. For example, because I worked in print media, I know that posters (at least 10 years ago) always had a “call to action” somewhere along the bottom. So, somewhere along the bottom of the poster you should tell your customer what you want them to do next (in our case it was visit our bundle of bitly links). Also, when I worked in print media I learned that people view posters and one-page flyers in a Z pattern – the eye begins in the top left, moves to the right, then diagonally to the left bottom, and finally ends at the bottom right. Therefore, it is best to have your logo, or other identifying information, in the bottom right. And, finally, I knew I wanted bright colors on our poster, to attract attention, and I didn’t want too much information in the poster, because it should act as a “teaser,” prompting people to either act on our “call to action” or talk to Jimena and I at the poster. We used Canva to create our poster. It is really user-friendly and intuitive. They have some really nice fonts and allow users to upload their own images. Anyone interested in making a poster can use the custom sizing to create large-scale prints. 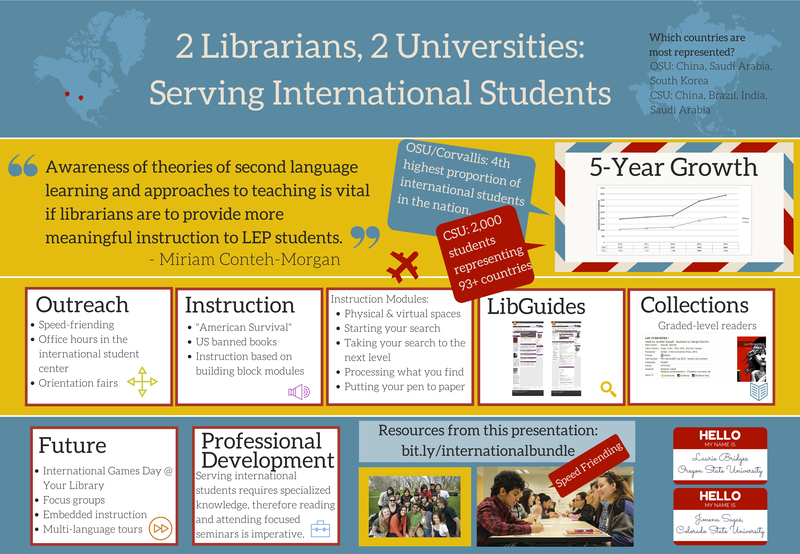 I’ve also used this website to create fliers for my faculty and signage with librarian profiles. In terms of poster content, we wanted to continue with the conference theme of sustainability by using a plant growth metaphor and related imagery to help guide the eye through our information. We also wanted to include photos of our students without having this overwhelm or distract from the content so we placed those in a simple row at the bottom. I usually report poster session research results in a very traditional, text heavy manner – Introduction, Methodology, Results and Discussion, with a couple of charts thrown in. This time my colleague, Erica England, and I wanted to create an infographic that summarized the information in a visually compelling and simple way. I often browse infographics sites to get ideas about presenting data and used easel.ly to create the poster. There are a number of free sites for creating infographics, but easel.ly is the best I’ve found so far. Erica and I also decided to create four 24”x31” posters instead of a larger 48”x96” poster for ease of transport. (I only had to take a 24” mailing tube; much easier to carry around than a 48” one!) After I created an account, I shared login information with Erica, which allowed us to work on the posters from different locations. We were able to make charts and a wordle, then upload and use those files. After creating a graphic you can save as a .pdf file, embed in a web site, or share via a link. 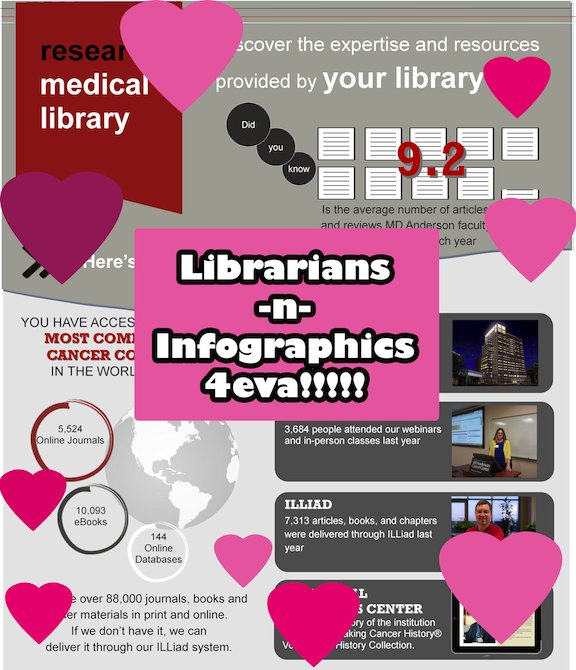 If we could visually communicate the love that librarians have for infographics, I think it would look a little something like this. I’m not sure when our love affair with icons and color-matching data began, but this visual expression of data and information is now a part of our librarian sphere. 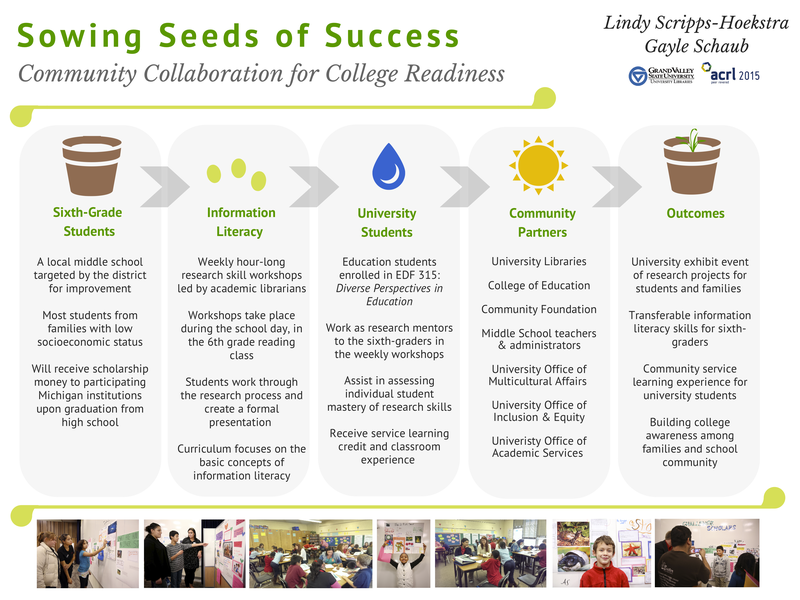 Whether we’re using infographics to teach students about information evaluation, or developing our own to share LibQual results, library impact or assessment findings, this method of conveying information is quite compelling. But creating good infographics takes time. You want them to tell a story, to build from one bit of information to the next until the people reading them get a complete sense of the narrative you’ve created. You can certainly put your knowledge of MS Publisher, Adobe Photoshop, InDesign or Illustrator to work and create your own infographic. Or you can take advantage of infographic creation sites like PiktoChart or Easel.ly. We’ve written about these easy-to-use graphic generator sites before, but I think as more librarians are compelled to share data and information visually, these image-creation sites are going to find a place in our day-to-day work toolkit. Robin Featherstone is an embedded research health librarian for the Department of Pediatrics at the University of Alberta. 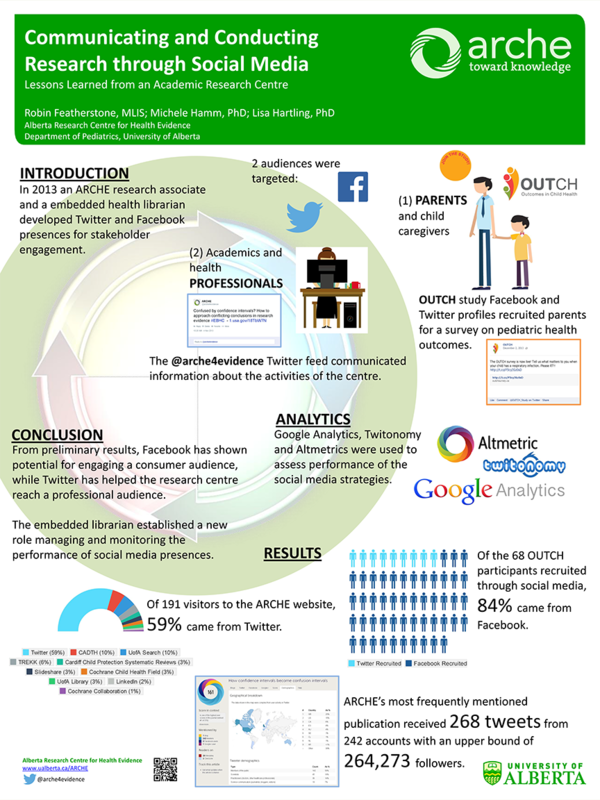 Her infographic was presented at the 2014 Canadian Health Libraries Association (CHLA) Annual Conference in Montreal. In it, Robin describes two different projects used to promote research through social media. It was created using Piktochart and is an excellent example of the use of infographic presentation to convey project results. Carina Gonzalez, Library Media Specialist at Lawrence High School in Lawrenceville, New Jersey has also opted to use an infographic (created using Easel.ly) to share information about weeding with her school community. We all know that sparks can fly when non-librarians hear about weeding projects, so creating an easy-to-understand visual representation of the process is a great way to communicate the weeding process. This infographic, made with excerpts from CREW: A Weeding Manual for Modern Libraries by Jeanette Larson, helps students and teachers garner a basic understanding of how a librarian chooses what to weed and what to keep. It specifically outlines the acronym M-U-S-T-I-E providing a concise introduction to weeding without overwhelming the reader with too much information. 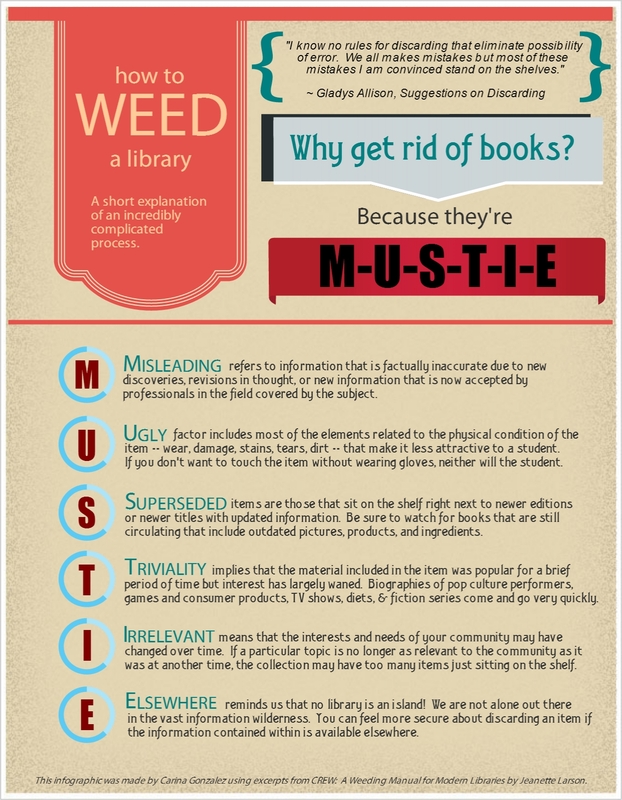 As librarians, we need the input of our school community on what we should or shouldn’t weed, and this infographic will inform others so they can give us the information we need to make the right decision. If you’d like more information about the infographics in this post, email Carina Gonzalez or Robin Featherstone.